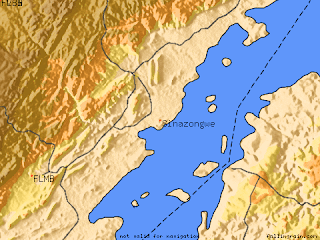 Location of Sinazongwe, next to Lake Kariba (in blue). I was perusing the internet and came upon a Red Cross Vulnerability Capacity Assessment (VAC) report about the Sinazongwe District. Because I will be placed here, I thought it good to better acquaint myself with the district, following up on a previous blog, which highlighted some of the broad geographical characteristics of the district. The Red Cross report gave important information about education, health, and livelihoods, in which I thought many of you might have great interest. The Sinazongwe District, populated by 11,528 people, is an elongated area situated at the very southern part of Zambia, comprised of two Chiefdoms: the Sinazongwe and the Mweemba. It is just to the northeast of Livingston, another major city in Zambia. It is a mountainous district with small pockets of settlements in the lowlands. The location of the district at the vortex of major roads leading to cities, Maamba, Choma, and Malima, has influenced the development of it into a rest stop for travellers. The ethnic groups, who make up the Sinazongwe District, are the Valley Tonga. The primary livelihood here is livestock, specifically cattle and goats, and fishing. The reason so much of the economy depends on these two primary sectors is because the district is generally extremely arid and has had problems with droughts in past years. This was especially the case in the early 2000, when the area benefitted from very little rain. As such, agricultural crops are difficult to raise in the district, creating many food and economic challenges for the residents. Nevertheless, the Tonga people who reside in the valleys cultivate small plots of land of less than a hectare. The condition of the soil in the valley, moreover, are not very fertile, which poses another food access challenge for the people. In 2007, however, the Sinazongwe district was victim to severe flooding, which took out the bridge connecting it to Lusaka and other major city ports around the country. About 100 houses, made of mud, were decimated. The district is still reeling from the impact of the floods. The district is also home to the largest, if not the only, coal mining industry in Zambia, which has resulted in the population growth and development of the district. The conditions of the mine, however, have not met safety standards and is on its last breath. The district government is hoping to sell it if it can find a buyer. The mine, unfortunately, has led to environmental and health problems for the community, so continuing to mine coal may not be such a fortuitious endeavor, especially because maintenance and improvement would cost the prospective company and the district government some money to upgrade. Land tenure is designated as Trust and Traditional. The former falls under the control of the President vis-a-vis the Commissioner of Lands, whereas Traditional land tenure is the domain of the Chief, who then determines occupancy and use rights allocations. Men usually make the decisions on land use, while women are relatively dis-empowered in this domain. Public transportation is available, but most roads are not paved. The only ones that are paved lead to the mine and to service areas, an indication that development of the transportation system has been connected to major corporate investment projects. While electric power is available in select towns in the district, telecommunications is poor, which creates a problem for me. I think this means I have to come up with an alternative means of communicating my progress in my placement during my tenure here. Sanitation throughout the district is also poor. The drought conditions create problems with water availability. The paucity and unsophisticated sewage and water infrastructure causes health problems and makes residents susceptible to cholera outbreaks and to diarrhea outbreaks, both of which contribute to dehydration and later death. There is a desire to build more pit latrines as well as a well-designed water infrastructure that allows residents to access clean and drinking water. Presently, they gather water from the streams and do not boil them. The health problems associated with poor sanitary conditions is compounded by HIV/AIDS and malaria. Malaria vaccines are, therefore, greatly needed by the residents. HIV/AIDS is exacerbated by prostitution in the area. Girls are known to be sold into prostitution due to household poverty. Respiratory tract infection, because of the district's mining activities, have also been discovered to be a major health issue among the residents. One of the weaknesses of the district is in education. The Red Cross VAC documented 40 schools offering education from the first grade through high school. The report gave no mention of vocational training programs for adults in basic construction skills or in skills that would augment livelihood activities for a larger market. Vocational training programs might help the district move in the direction of future sustainability if the right skills and knowledge were offered. In the next blog, I will write more about food production and food security in the district. Fundraising Note: This weekend, I received more donations from residents in Amherst. Thank you to Susan, Robert, and my aunt, Chona. My old floor mate in Cashin Hall at UMASS-Amherst also helped my with my fundraising effort. Together, they gave $95 this weekend, which brings my total funds raised to $375. Thank you once again to everyone who has sponsored me. I hope to break $400 by next weekend.